In the early days of blogging, the ability to comment set the technology apart. In those days the web wasn’t very interactive. Blog comments were media’s first step to becoming social media. A blogger would share their thoughts in a post, but then anyone in the world could respond in the comments. It created a dialogue that truly gave voice to the people, and introduced a measure of accountability that had long been absent in mass media. But are blog comments still as important today? The wider world quickly picked up on the power of comments and added a comment field to every bit of content. Now newspapers and YouTube are infamous for regularly featuring the depths of human depravity in their comments. Does Your Blog Need Comments? Comments have been an assumed part of blogging since the beginning. That inherent nature of comments means that shutting them off is a bold step. And so people have been debating since the beginning whether or not blog comments are required. The debate has existed for years, but it’s flared up again lately. And if you want even more anti-comments opinion, Matt Gemmell offered his reasons for shutting them off, then offered a follow-up a month later and then created a collection of comments commentary. Whew. But let’s not pretend everybody is anti-comment. Then again, blog comments haven’t changed much in the six years since Mullenweg made that comment. So now what? You can side with Chris Brogan and Seth Godin and go no comments. Or join Matt Mullenweg and Chris Lema and keep the comments coming. But really, it’s your site. You need to make your own decision. Welcome interaction. Part of what made blogs popular was that they allowed for conversation. Yes, conversation has moved to social media, but by having comments on your site you’re encouraging that conversation. That comment field is a welcome mat: C’mon in! Gut check. Comments can often serve as a double check of what you’re saying. By keeping that comment field open, you give people a chance to call out your B.S., correct your wayward facts or confirm what you thought. Making that public and putting it directly below your post, that keeps you honest. Add value. Part of that gut check is added value. Commenters can correct any errors or point to helpful resources. They might add an additional thought or a recommendation you never would have thought of. And now your post is better because of it. Community is fun. Let’s face it—it feels great to see someone post a comment on your blog. You feel validated. Your site is clearly being read by other people. It develops a sense of community among your readers, and that’s cool. People like to be where the action is. Better methods. The conversation has moved because there are better ways to have that conversation. So move with it. Instead of engaging on your blog, engage in social media. Get some confidence. Relying on comments as a fact-check or to validate what you’re saying is a crutch. Check your own facts and stop relying on the ego boost of strangers. And it’s OK to go back and update a post. Lost in the weeds. Sometimes comments add value, yes. But only if people can find them. Wading through the weeds of self-promotional comments, spam, and useless platitudes is a lot of work. Is it worth putting your readers through all that? Community is overrated. People can be jerks. And online, they will be. The trolls come out, the filters disappear and people say some horrible things. Who has time to moderate all of that and keep it civil? You can turn the comments off. As Chris Brogan says, “We will all be OK.” Or keep them going. It’s up to you. And really that’s how you should decide. What fits for your site? If you’re all about community engagement and interaction, blog comments are probably a no-brainer. But if you’re a slick, straight-to-business site, you probably don’t have time for the distraction of comments. Is it important to build community and engagement on your site? Can you handle the unruly trolls, the spam, the transparency? Or would another medium be a better fit for interaction? These are the questions you need to answer when you’re considering comments for your blog. Myself, I think they are still important, but it really depends on you, your blog and other variables. I have done posts on this subject as well as a podcast. I understand the many reasons why some have chosen to remove them. And that’s fine. But I also see that when the “big names” broadcast that they have removed commenting, often people won’t even read the reasons behind it and then just suddenly jump on the bandwagon because “so and so” said it. They don’t take the time to consider what they are really doing. I think this will be a debate for a long time to come. Did I miss the bit about which plug in could stop comments being so time consuming to manage? From my perspective forums died first, now Blogs follow. Discussion happens in Facebook, Twitter and the other Social Networks. Commenting on blogs will vanish with the next generation, the Facebook Generation. If you open your comments and have a valuable site you get spammed really badly, so you might as well let Facebook handle this. I hardly believe forums have died. If anything, they are seeing a resurgence thanks to a fresh take on discussions. Look at Discourse as a great example. Muut is also a nice take on community discussions. 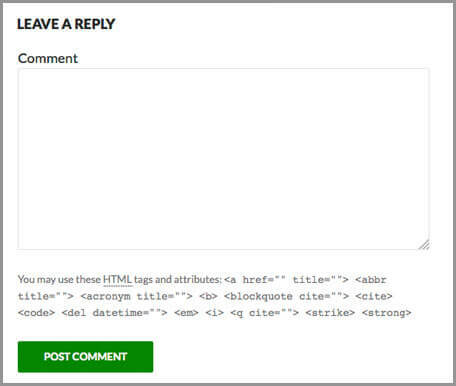 These solutions also have ways to replace the comments in WordPress with replies in the forum as a way to combine the best of both worlds. That’s where I see comments heading.